...where ELTZE would you go? If you are looking to sell or let your property, Eltze Estates, your family run estate agent, with over 85 years of combined experience can help. We pride ourselves in our attention to detail and going the extra mile. Welcome to the web site of Eltze Estates Ltd the Estate Agent Selling & Letting property in Iver, Iver Heath, Richings Park, Langley, George Green, Slough, Wexham, Stoke Poges, Burnham, Taplow, Eton Wick, Colnbrook & West Drayton. Bob & Laurie Eltze and their experienced team including Mark, Jo, Peter, Sandra, Giles & Ed are available to help with any property related enquiry. Our professional, friendly and approachable family run estate agency cares. As your local independent estate agent, we are experts in your area and can advise you about the local environment and provide accurate valuations for selling or letting. Pricing your property correctly and presenting the property in the best possible condition provides the best chance of a buyer or tenant being found. We are members of the Property Ombudsman scheme and adhere to a strict code of conduct. Welcome to NEW Eltze Estates App! 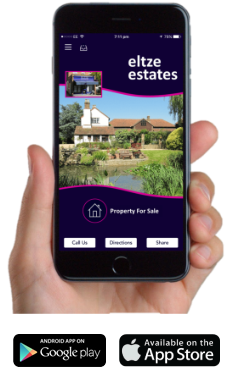 Please down load our App for the Apple or Google store and be the first to know when a property comes on the market to let and for sale. Our dedicated App has lots of handy features such as a rent affordability calculator, stamp duty calculator, Property news section.